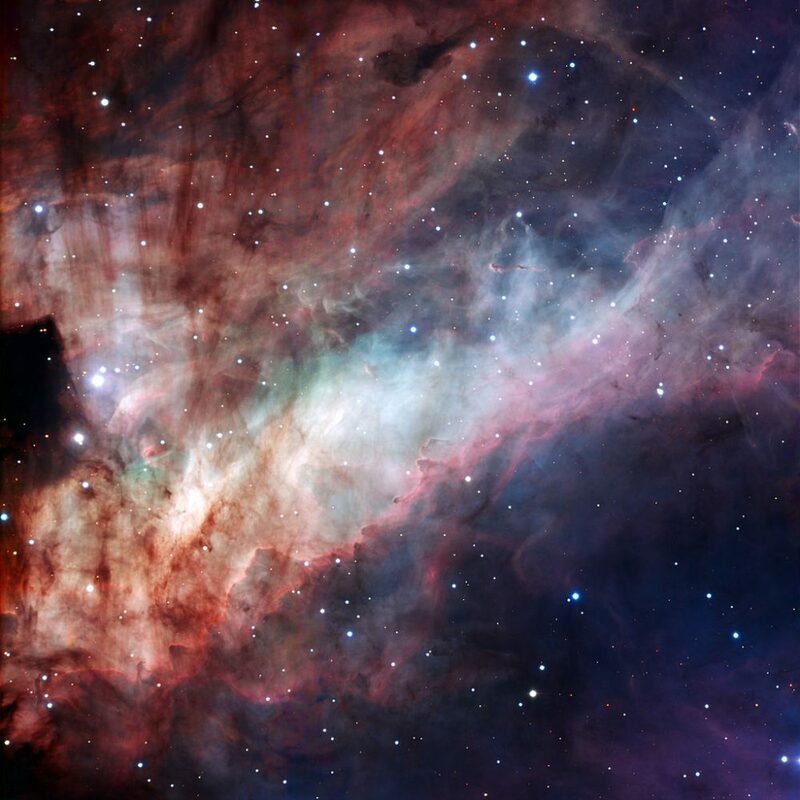 The Omega Nebula, also known as Messier 17 (M17), is a bright emission nebula located in Sagittarius constellation. It was named Omega for its resemblance to the Greek letter omega, Ω. The nebula has the designation NGC 6618 in the New General Catalogue. It is also known as the Swan Nebula, Horseshoe Nebula, Lobster Nebula, or Checkmark Nebula. 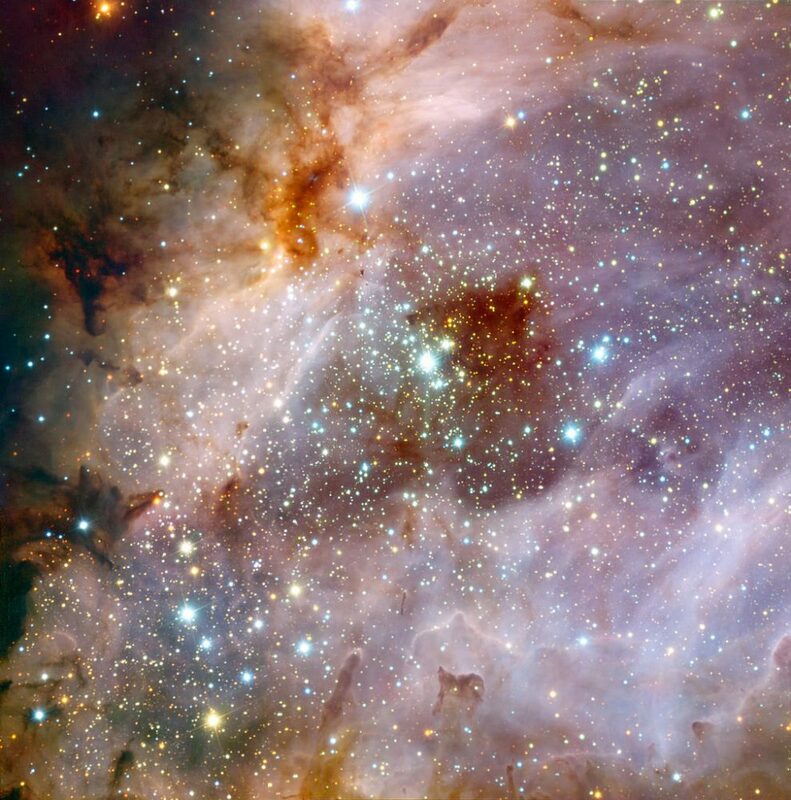 Messier 17 is a star forming region with an open cluster, and it is part of a larger cloud of molecular gas found in the direction of Sagittarius. 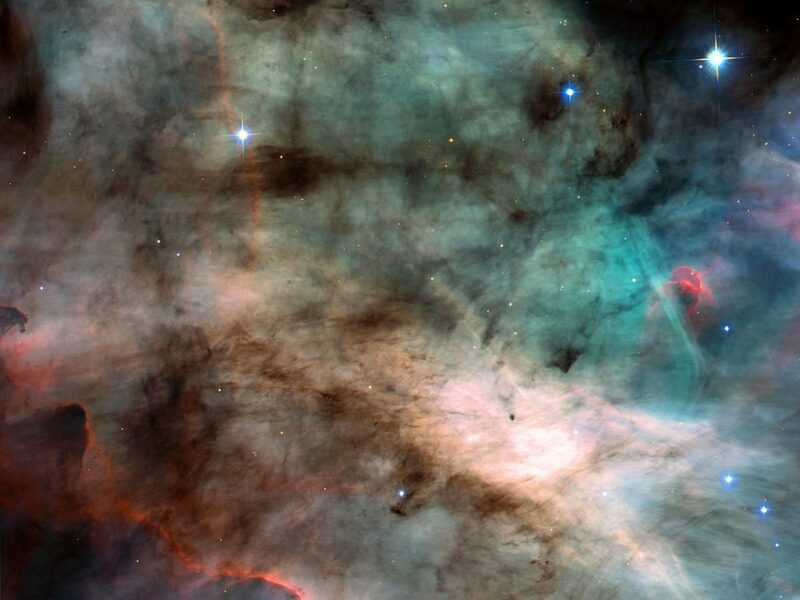 The Omega Nebula lies at a distance between 5,000 and 6,000 light years from Earth, a bit closer to us than M17’s larger neighbour, the Eagle Nebula (Messier 16). M17 is one of the brightest, most massive star-forming regions in our galaxy. It has a diameter spanning about 15 light years. 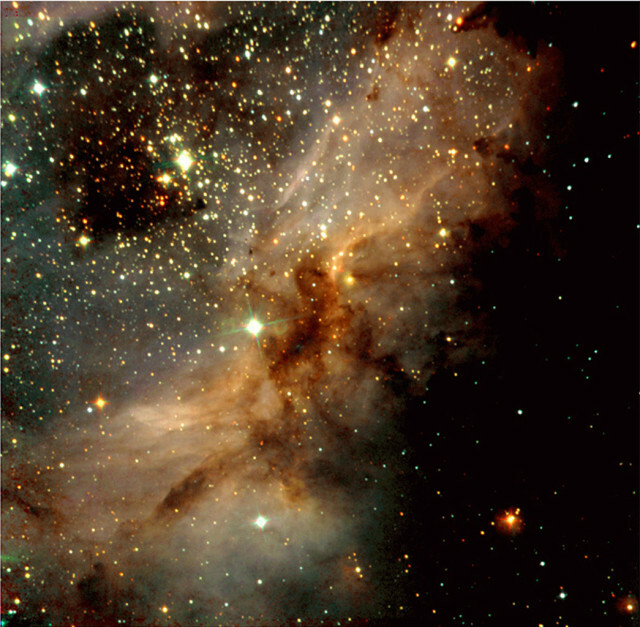 It is illuminated by 35 hot, young stars that form an open cluster, embedded within the nebula. The Omega Nebula is part of a larger cloud which is about 40 light years in diameter. 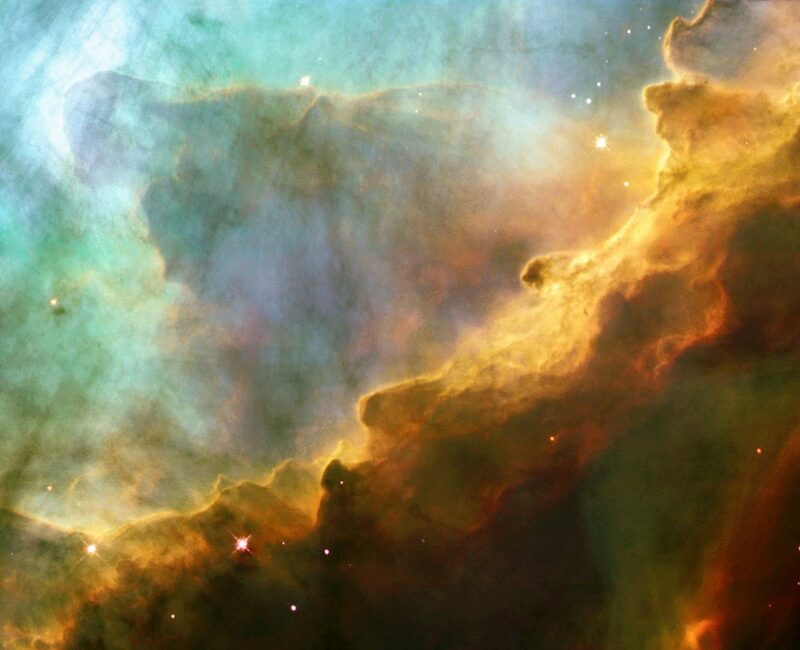 The nebula has an estimated mass of 800 solar masses, while the cloud has approximately 30,000 solar masses. 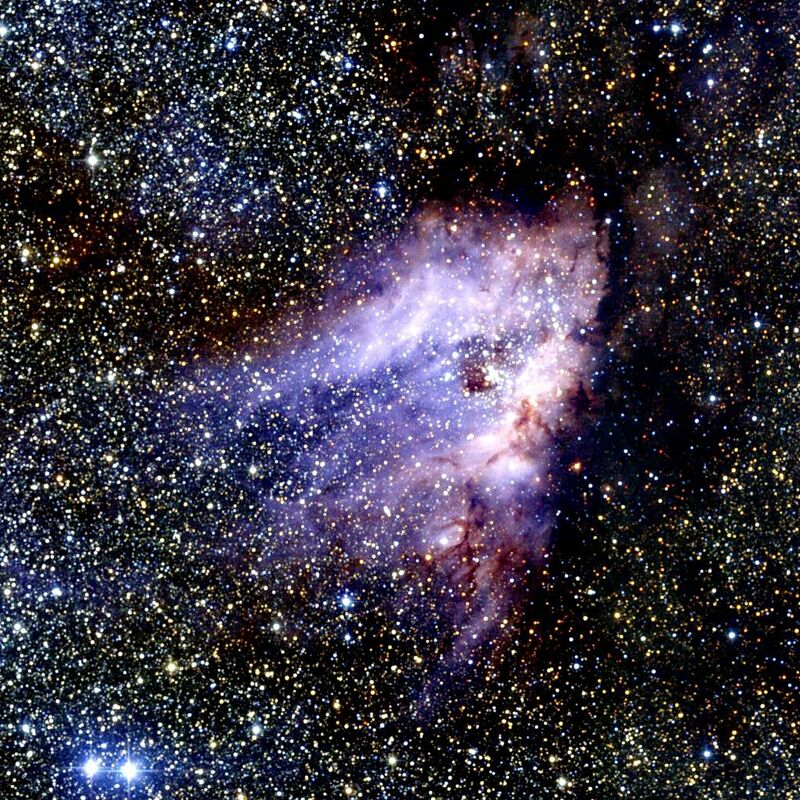 Messier 17 lies in the Sagittarius arm of the Milky Way Galaxy, also known as the Sagittarius-Carina arm. It has a geometry similar to the famous Orion Nebula (Messier 42), but unlike M42, which appears face-on when observed from Earth, the Omega Nebula appears edge-on. 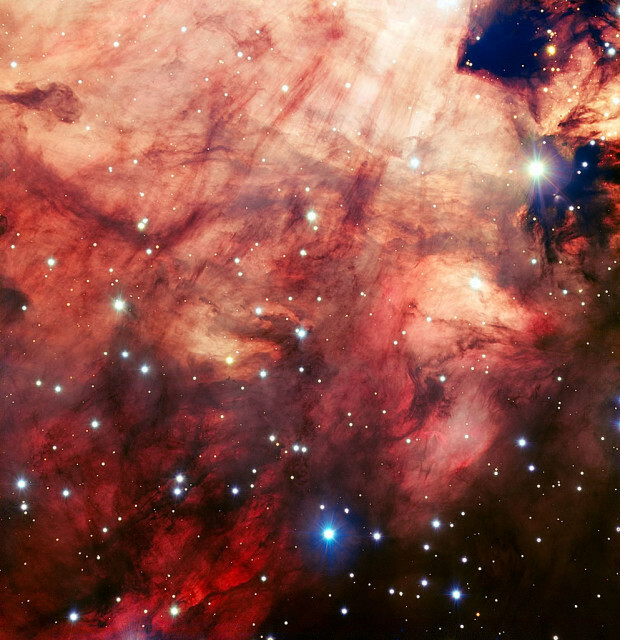 The Omega Nebula’s reddish colour is the result of hot hydrogen gas being illuminated by newly formed stars in the nebula. M17 contains a large amount of dark obscuring material, which is also heated by the hot young stars, and can be seen in infrared wavelengths. The Omega Nebula contains up to 800 stars in total. About a hundred of them belong to a spectral class earlier than B9, while nine of them are type O stars. 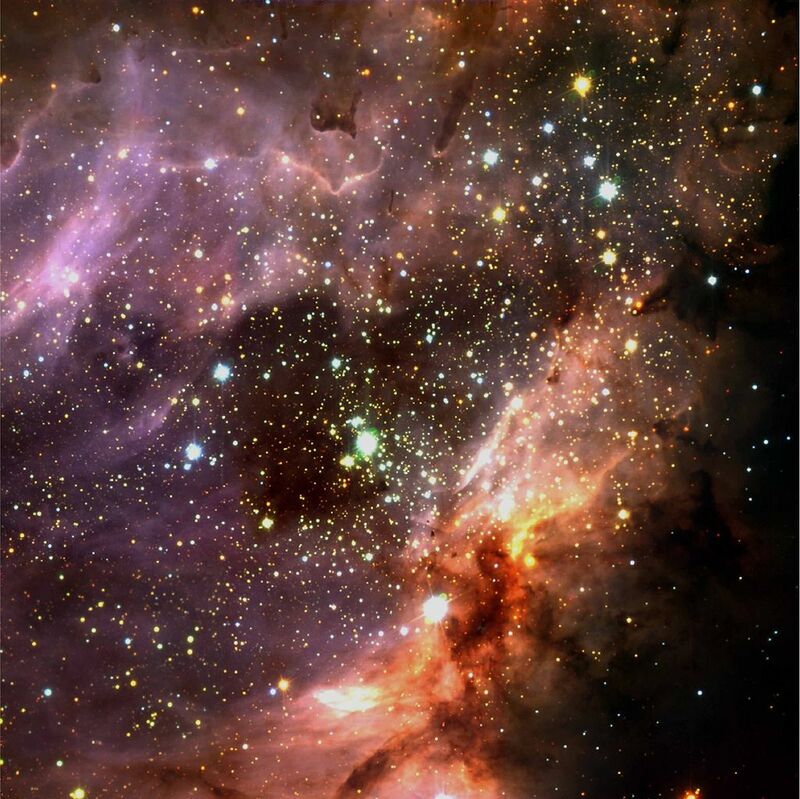 There are also more than a thousand stars being formed in the nebula’s outer regions. 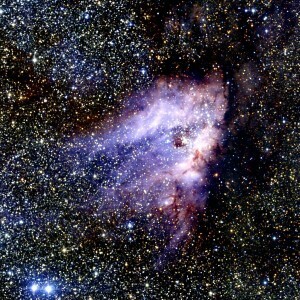 M17 contains far more newly formed stars than the Orion Nebula. 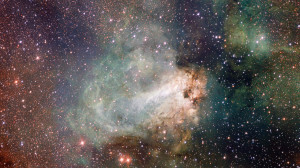 The stars in the Omega Nebula do not readily appear in optical images, but are hidden within the nebula. The 35 young, massive stars responsible for the nebula’s glow are each 20 to 30 times more massive than the Sun and about six times hotter. Their ultraviolet radiation erodes the dense cloud in which they were formed. The cold hydrogen gas clouds are heated and shaped by the radiation, and the pressure causes some of the material on the surfaces of the clouds to stream away, creating an intricate structure than obscures the clouds in the background. The nebula’s glowing gas will eventually be completely eaten away by the radiation of the newly formed stars and leave behind a small open cluster. The open cluster within the nebulosity is one of the youngest open clusters known. It has an estimated age of just 1 million years. A star designated HD 168607, a luminous blue variable (LBV), is believed to be associated with it, as is the nearby HD 16825, a blue hypergiant. Messier 17 can be seen without binoculars in good viewing conditions from locations that aren’t too far north. It is located roughly 10 degrees north of the Teapot asterism, and roughly at the same distance from two other famous nebulae in Sagittarius, the Lagoon Nebula (Messier 8) and the Trifid Nebula (Messier 20). 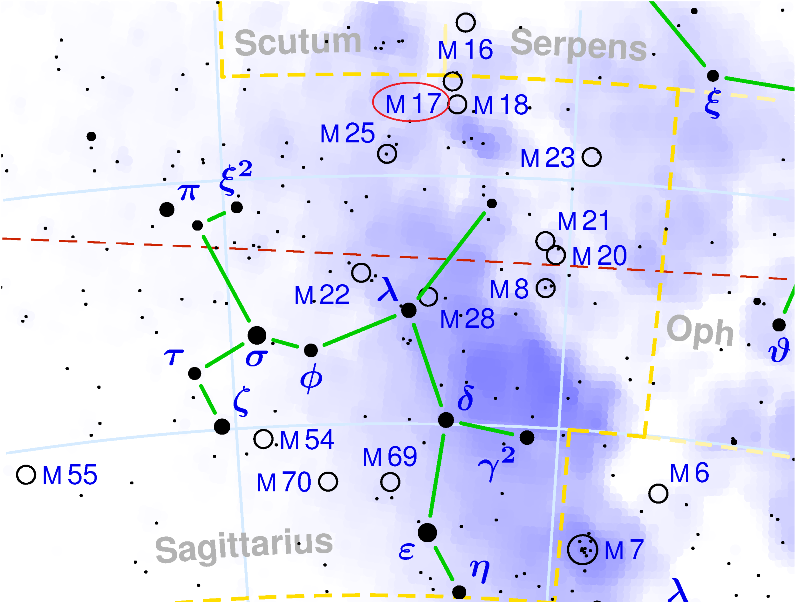 M17 can easily be found in binoculars by starting from Lambda Sagittarii, the star marking the lid of the Teapot, and moving north, past the Sagittarius Star Cloud (Messier 24). The small open cluster Messier 18 is a degree to the north and Messier 17 lies another degree to the north. It is bright enough to be seen even with moderate amounts of light pollution. The Omega Nebula can also be found by first identifying Gamma Scuti, a magnitude 4.70 star in Scutum constellation. 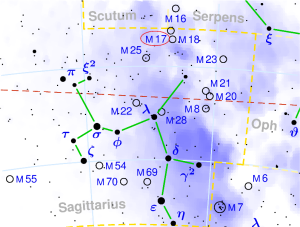 M17 lies just over 2 degrees to the southwest of the star. Gamma Scuti can be found by following a line from the bright Altair in Aquila constellation through Delta and Lambda Aquilae. For observers in northern latitudes, the Omega Nebula is one of the three finest emission nebulae that can be seen in a small telescope, along with the Lagoon Nebula (Messier 8), also in Sagittarius, and the Orion Nebula (Messier 42) in Orion. The Omega Nebula was discovered by the Swiss astronomer Philippe Loys de Chéseaux in 1745. It is one of only six nebulae included in his catalogue. Messier 17. Image: Two Micron All Sky Survey (2MASS), a joint project of the University of Massachusetts and the Infrared Processing and Analysis Center/California Institute of Technology, funded by the National Aeronautics and Space Administration and the National Science Foundation. Others who have sketched the nebula include William Lassell in 1862, who used a 4-foot telescope at Malta and Edward Singleton Holden in 1875, using the 26-inch Clark refractor at the U.S. Naval Observatory.